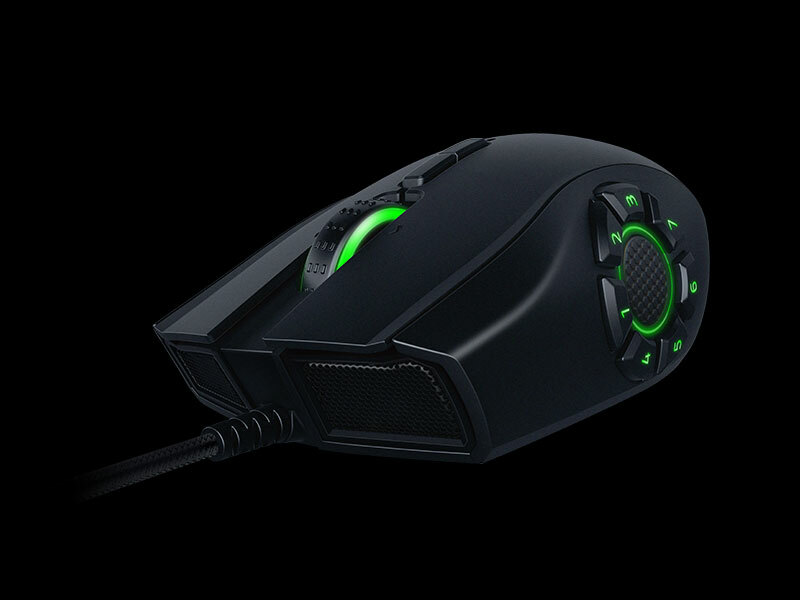 A world leader in high-performance gaming hardware and software, Razer has released yet another version of its Naga mouse that designed specifically for MOBA gaming, the Naga Hex V2. The key to the Naga Hex V2 is the 7 button mechanical thumb wheel and the pre-configured MOBA profiles optimised for your League of Legends, Dota 2 and Heroes of the Storm sessions. The body of the Naga Hex V2 is identical to the Razer Naga’s, meaning that it has a bulky profile, a highly elevated palm rest and a full-sized rest for ring finger on top of the mouse, rather than on the side. There are 2 buttons beneath the scroll wheel, which are good for vertical scrolling or adjusting the dots-per-inch (DPI) sensitivity. Where the things get interesting is around the thumb. There are seven rectangular buttons surrounding a central padded thumb rest. The upper row goes 4-1-2-3, and the bottom row goes, 5-6-7. The Hex V2 features a full Chroma palette for colorful backlighting, and as well as a sensor that ranges from 200 DPI to 16,000 DPI. Users can control everything by the Razer Synapse 2.0 software, which both lightweight and easy to use. With a redesigned hex grid and a much bigger body, the new Hex V2 is an ambitious device with clever button placement and plenty of customizability. Whether you find the innovations frustrating or useful, though, will largely come down to your playstyle. In simple word, the Hex V2 is a colorful, comfortable and creative mouse which revamps a fan-favorite design in an intelligent way. Naga Hex V2 is now available at BestBuy and Razer store for $79.99.